Welcome to our 27th IAEG Connector, the electronic newsletter connecting engineering geologists around the world! This has been an exciting week! I got to travel to Paris, France, to help the French National Group celebrate their 50th anniversary. It was on Nov. 22! I have a summary below of the event, and I have information on the book that they published. 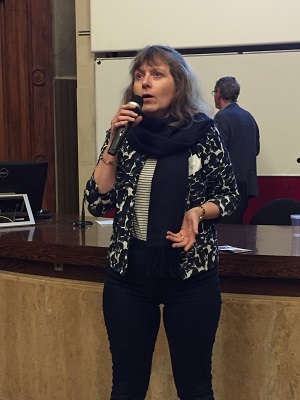 I presented my last keynote as president of IAEG, but this time I spoke French! It was not great French, but it was not English. It is a wonderful group, and below you will find a summary of the event. Secondly, at the event in Paris we awarded Louis Primel the Marcel Arnould Medal! Instead of awarding it in San Francisco at the Congress, we decided to present the award in the town where Marcel Arnould lived! The ceremony and reception were wonderful, and we have photos! Louis Primel is a wonderful man who well deserved the award! Third, my good friend Dr. Shu-Ghang Li from China sent me a wonderful site on open groundwater modeling so I am passing that on to you! 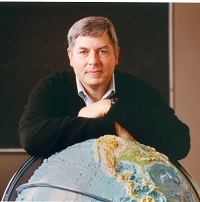 If you have sites that you want to pass on to engineering geologists around the world, please email them to me (burnss@pdx.edu), and I will put them in the Connector! This week has been an exciting week for geologists around the world with the landing of the Mars Lander! I have added many news items on landslides and volcanoes too this week! 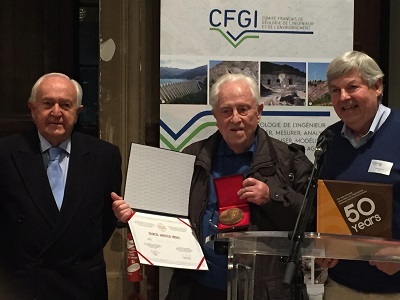 On Nov. 22, President Scott Burns awarded Louis Primel the Marcel Arnould Medal in Paris at the celebration of the 50th anniversary of the French National Group of IAEG. Louis Primel has been active in IAEG for many years, and at one time he acted as secretary general of the organization for 16 years, serving under four presidents! He also started the newsletter (along with President Ricardo Oliviera) and was very active in the early success of the Bulletin. It was awarded in Paris instead of San Francisco because we knew that it would be special to receive the medal in the town where Marcel Arnould was so active with IAEG. The medal is awarded every two years to someone who has been very active with IAEG. Louis Primel receives the Marcel Arnould award in Paris. To the right of him is President Scott Burns and to the far left is past president Ricardo Oliviera. 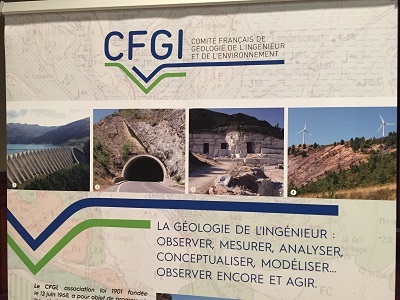 On Nov. 22 November, I had the honor of attending the 50th Anniversary Celebration of the French National Group of IAEG (CFGI: Comite Francais de Geologie de L’Ingenieur et de L’Environement) in Paris. It was held at an absolutely beautiful old building (National Conservatory of the Arts and Meters) in a hall that was constructed in 1847, but has been updated for conferences today. It was quite a celebration! 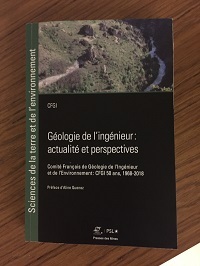 They published a book for the celebration (Geologie de l’ingenieur actualite et prespectives) for the occasion! 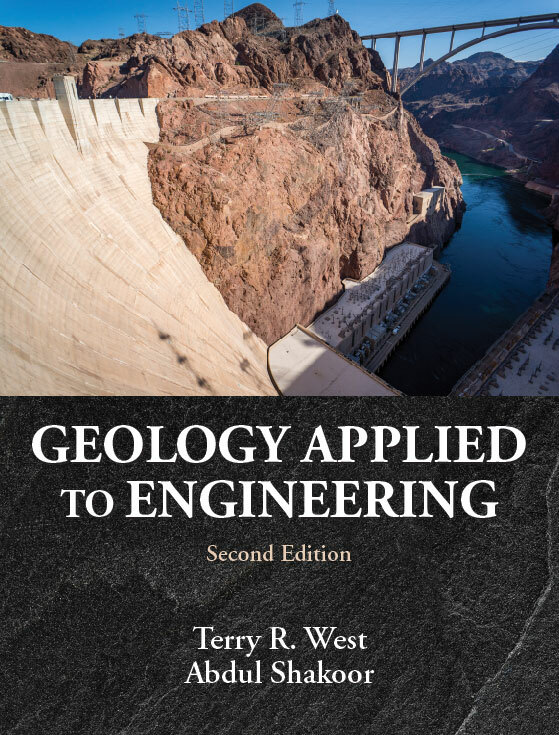 In the book were many articles about the history of engineering geology in France and how the profession operates today. The day was a succession of speakers talking about the history of engineering geology in France and all of the sectors where engineering geologists are working today: making maps, nuclear power industry, hydrogeology, making metro lines in Paris, aggregates, active mines and reclamation, education programs and expert witness work in the courts. I got a chance to update everyone on the last four years of activity of IAEG and also present a keynote on landslides. Past president Paul Marinos also gave a special talk on tunneling! There were 148 attendees present at this beautiful building for this event, and 15 students also attended the celebration and signed up to become members of the national group! At the end of the day there was a very nice reception where I got a chance to present the Marcel Arnould Medal to Louis Primel who was secretary general of IAEG for 16 years! To help me present the medal we had past IAEG presidents Ricardo Oliviera and Paul Marinos present. It was a special day! I would like to thank President Aline Quenez and her committee for such a wonderful celebration! Jean-Alain Fleurisson, our IAEG Treasurer, is also vice president of the national group and was very active during the day! President Anile Quenez addresses the conference on the 50th Anniversary!